Skybourne #5 Review – AiPT! 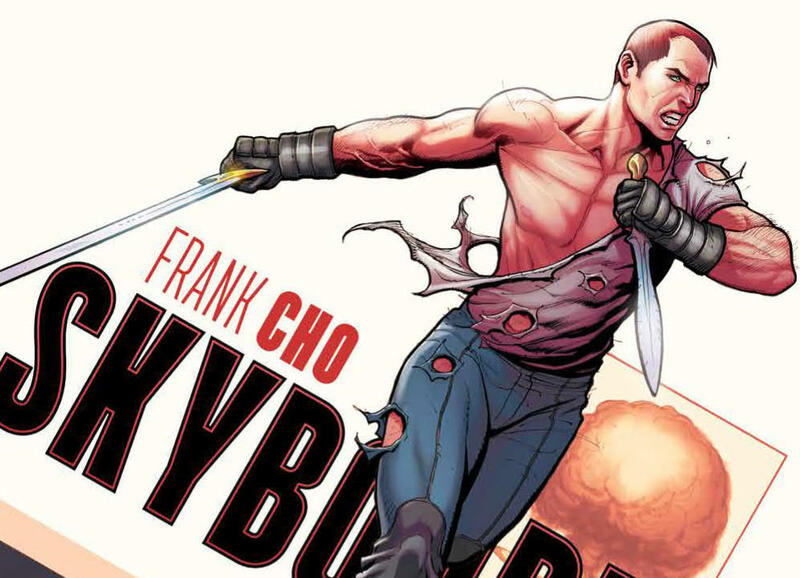 The final issue of ‘Skybourne’ is brainless, but fun. It has been seven months since the last issue, but finally Frank Cho finishes his fantasy meets superhero epic this week. Since it’s Merlin (who has an army of dragons at his disposal) vs. a hero who can never die you know this is going to be a Michael Bay epic ending. Frank Cho is an exceptional artist and this series has proven his writing ain’t bad either. The story has been high on action and entertainment. There’s no reason to think he can’t stick the landing on this final issue. Is it just me or is this framed oddly? Cho has a good handle of action films because he plays around with language in surprising ways in this issue. You would never expect Merlin to shout “F--k you” in response to a barb from a hero for instance. It’s rather simple stuff, but to see a character hold up a machine gun and say, “This m----------r is about to have an accident” — let’s just say there’s plenty of enjoyment in the badass one-liners. Especially when it comes to blowing away dragons and other beasties. The story is very simple and mostly involves a hero lunging at the villain with a sword and defying the odds. There isn’t much in this issue that is surprising save for a scene with Skybourne’s sister talking about her breasts and the big apocalyptic beastie coming through the gates. No, this is mostly going to be read by folks who enjoy Cho’s art. He doesn’t disappoint. There are double page and full-page spreads that are gorgeously rendered in high detail. He has a clean style that suits the action. A nice dramatic beat to open the issue. This is bubblegum comic book reading at its finest. The villain seemingly had an advantage (the last four issues kept making Merlin out to be impossible to defeat) and he goes down so easily it’s a disappointment here. There isn’t a lot here to really think about or enjoy outside of the action and art. Even Skybourne and his sister have a lackluster moment together that doesn’t add much. Given the 7 month delay and the quickness in which this issue wraps up its story one could imagine Cho was rushing to get it over with. The cliffhanger promises there could be more, but given the simplicity of this ending and the zero effort put into building up the characters and world I would be surprised if a sequel was ever created. If you like big action and clean art you will love this. If you want a comic that has a little bit more as far as character and plot you will be sorely disappointed. Let’s just chalk this up to getting an ending to a story I had doubts we’d ever get. Fun one-liners and great art are good, but not enough to make it great.